Models Own is a cosmetics brand that was originally founded in 2008 by Ministry of Sound’s CEO and his brother. In 2014, Models Own received investment from a Saudi retail empire and has since expanded its core offering to include lip and eye products, as well as associated accessories. Models Own opened its first global flagship store in Westfield Shopping Centre in Stratford, East London in late 2016, closely followed by a second store in Trinity Leeds, and is currently Europe’s fastest growing cosmetics brand. 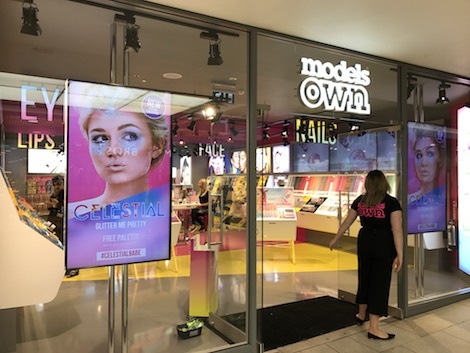 Models Own wanted to enhance its retail presence and grown its market share by opening a flagship store that would serve both as a “beauty playground” for its customer base and as a new product launch pad. The company wanted to utilise the benefits of digital signage, such as great visual impact and the ability to increase footfall in the store, to engage their teenage market customers even further. In Westfield, the digital signage network comprises 10 x 65” high brightness LG displays, set up in a 5 x 1 configuration format, to create two stunning videowalls that run down either side of the store entrance. The window displays comprised 2 x Samsung 75” displays. In Leeds, the digital signage network comprises 6 x 65” high brightness LG displays, set up in a 3 x 1 configuration format, to create two stunning videowalls that run down either side of the store entrance. The window displays comprised 2 x LG 65” displays. 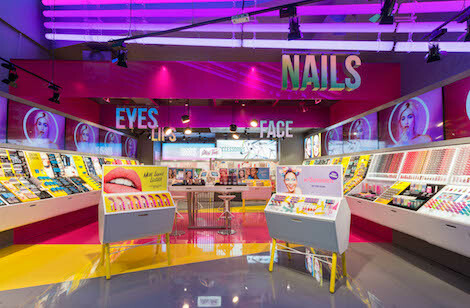 The videowalls are used to showcase makeup artists working on models, to promote new product ranges and special offers, to showcase makeup bloggers highlighting real world product usage, or to broadcast live in-store demonstrations. Giving customers the feeling of being surrounded by on-screen entertainment, similar to a cinema experience. Digital signage installation was provided by Digital Messaging Company (DMC). Video and promotional content, which is created by Models Own, is re-purposed, animated and scheduled by DMC on their behalf, and then uploaded onto Signagelive’s digital signage network platform, providing a centralised repository to store content and eliminating the need for onsite servers. DMC is expecting to roll out video walls across further new stores in the UK. This entry was posted on Wednesday, November 22nd, 2017 at 07:18 @346 and is filed under DailyDOOH Update. You can follow any responses to this entry through the RSS 2.0 feed. You can leave a response, or trackback from your own site.